I do! Especially since my son's world right now is circling around his "Solar System" and every discussion I have with him revolves around....The Sun and its' planets. But, do I REALLY love the sun? In a way, YES AND NO. Yes because the sun is very important for us to survive but science aside... NO! I don't like it for the fact that I sweat more than usual and I'm starting to have headache with the extreme heat! But how to survive the summer? 2. Keep cool (physically and emotionally). 3. Protect yourself from the sun! Thankfully, I've done numbers 1 and 3 consistently nowadays (wishing I could do number 2 more often! LOL). With the help of my favorite beauty store Watsons, I was able to find some goodies that will keep me feeling cheery this summer! 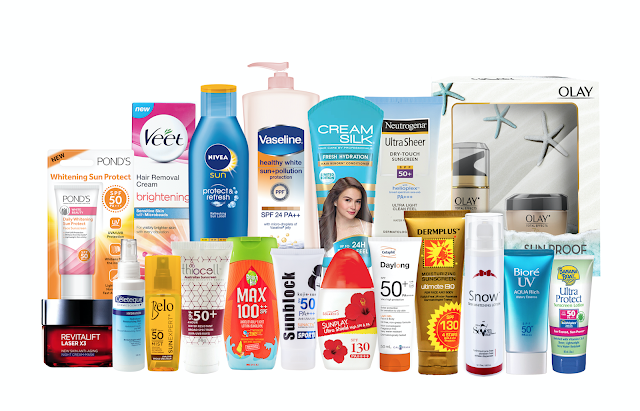 I personally love the brands Nivea, Belo, Banana Boat, Sunplay, Biore, Neutrogena, Solstice, Beach Hut, L'Oreal, Cream Silk, Pantene and Vitress. But, there are actually other participating brands you may want to look into --- Banana Boat, Dermplus, Kojie San, Hawaiian Tropic, Cetaphil, Olay, Pond’s, Snow, Celeteque, Thiocell, Shiro, Gluta-C, Vaseline, Veet, Lactacyd, Dentiste, Chic, Bobbie and Body Fantasies. Here's what can cheer us more! All SMAC members can get a chance to win a trip for 4 to any of the following destinations: Japan, Korea, Thailand, Taiwan, and Hong Kong. Every P500 single-receipt purchase of participating products is equivalent to 1 e-raffle entry to join the promo. If you want to watch my video on my thoughts on some of the sun care products I've used in the past, visit HERE. What's your favorite item from Watsons mentioned above? Kojie san for kids are my everyday staple lately. ahh they have for kids?? ?